Hey Joenatics! We’re working with Three Notch’d Brewing Company to collect items for those affected by Hurricane Irma. We’re looking for volunteers and donations. Starting tomorrow, we’ll be filling a truck full of items. 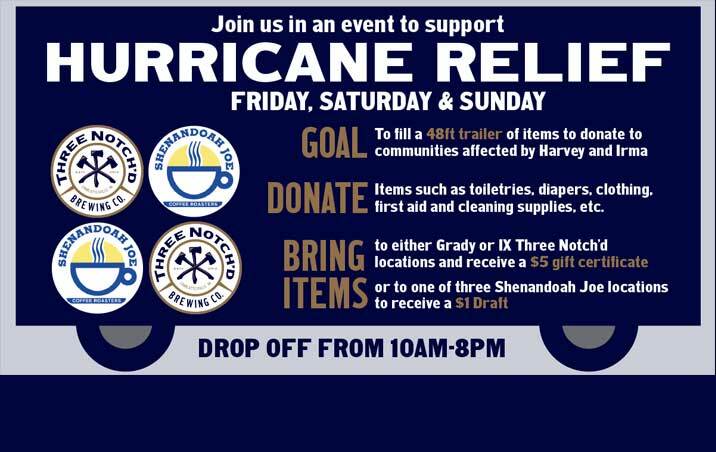 We’ll be collecting donations on Friday, Saturday, and Sunday from 10am to 8pm at the Three Notch’d brewery and restaurant at IX Art Park as well as the Grady taproom. Let’s do this!